Update: See my followup to this after six months. 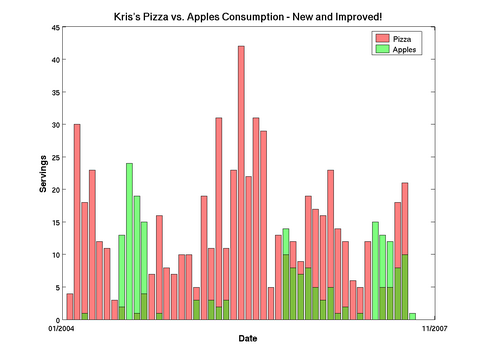 Many of my friends know that I am almost obsessive about collecting data about all kinds of stuff (the pizza versus apples graph, which is sadly out of date, is particularly notorious). I also keep track of my expenses pretty precisely, cataloging and categorizing everything I spend money on. Now that I’ve lived aboard Oia for a little more than a month, I can start to ask the question: is living on a boat in Singapore cheaper than living in a rented apartment? Of course it’s really too early to ask this question since expenses vary from one month to another and you really need to gather data over time, but at least I can compare my first month of living aboard to a representative month of apartment living and see how things play out. In Singapore, living on a boat has ramifications not just for the cost of housing (rent for an apartment, berthing for a boat; and utilities), but also for transportation, since there are no marinas really convenient to public transportation. Actually, that’s not completely true: RSYC is decently close to buses, and Keppel Bay Marina is in walking distance (15-20 min) to Singapore’s metro, the MRT. But Keppel Bay is full and not accepting new vessels now; and RSYC is, from what I’m told time and time again, too rolly to live aboard. (I may judge that for myself eventually.) And of course, when you own a boat, you need to take care of it; and by buying an older boat I set myself up for a variety ongoing maintenance expenses. I decided to compare the month of March, my last full month in my studio apartment at City Square, with my first month living aboard Oia (April 17 to May 16). The big caveat: I’ve found myself spending the night in “mainland” Singapore fairly often, which means I’m only really “living aboard” (or at least, sleeping aboard) a little over half the time. I looked at most of my expenses, but only some of them really changed when I moved aboard, so I’m only including those here. I converted everything to US dollars with the prevailing interbank rate on the date of the expense. Please don’t use this data to steal my identity or sell me stuff or do anything else nefarious. The first takeaway from all this is that Singapore is expensive. That apartment rental rate is, in fact, obsolete: the market rate for the same apartment is now above S$3000 (today, ~US$2130). And while it was certainly a nice, new apartment, it was by no means ostentatious, having only one room with no separate bedroom. Of course, it does reflect my preferences: having a place to myself instead of renting a room, convenient to work, and so on. If you really have to you can get a room somewhere away from the CBD for around US$500. There is less flexibility in berthing rates in Singapore, of course, since there are only a few marinas. However, One 15, where I’m staying now, is among the most expensive; if I was prepared for the inconvenience, I could move to Changi and save US$150. But it doesn’t seem worth it. Utility costs are dramatically lower for a couple reasons. I got rid of my internet costs altogether (I included them with utilities because for me, internet is a utility almost as essential as electricity or water). Most marinas provide free wifi. Transportation is interesting. I was concerned this was going to be a big drain because I generally have to take taxis to and from One 15. I also have to pay an entrance fee to Sentosa, the island where the marina is, because they won’t consider me a resident unless I own an apartment there. That’s S$2 on weeknights and S$6 on weekends, not trivial. And indeed, transportation has been kind of expensive, with almost 90% of my transportation costs over the last month spent on taxis. But it turns out I spent quite a bit on taxis before I lived on a boat too, and the MRT isn’t super-cheap either, so at first glance my transportation costs have only gone up somewhere between 30-50%. The caveat I mentioned above, that I stay away from the boat fairly often, comes into play here, and I could reasonably guess that my taxi costs would increase by another US$200 if I really commuted to and from the boat every single day. Something I hadn’t thought about until I moved aboard is the cost of food, in which I include grocery costs and eating out. Since I’ve been living aboard, I find myself eating out a lot, which is both more expensive and less healthy. Mainly I’m eating out more because I’ve been reluctant to use Oia‘s fridge: the current batteries aren’t all that super and I’m not consistently at the boat to make use of food there anyway. I also have yet to really get around to cleaning and organizing the galley to my satisfaction. I’ll have to start cooking soon anyway, because I miss it. Obviously the big change of having a boat, particularly an older one, is that you need to take care of it. There are a lot of projects in motion: new upholstery, new electrical system. There are also a lot of smaller things I need or want: new life vests, a grill, various new electronics, and so on. All of this stuff adds up to what’s essentially a recurring boat maintenance cost. Last month that was around US$1k, which is maybe a little less than it’ll be on average over the next year or so. In a furnished, newish apartment, you don’t often have to buy new “stuff” or fix things yourself, so this is an all new expense. In all it appears at first glance that, at least for me, living aboard in Singapore is comparable in cost to living in an apartment — not much cheaper. Really it’s just a shift of expenses. Instead of paying rent, I’m spending some more on taxis. Instead of paying more rent, I’m spending some more on food. And instead of paying yet more rent, I’m spending lots on boat projects and boat stuff, which is a welcome shift — at least it’s fun and rewarding to spend money on those things, which yield challenging projects and require some interesting research, whereas spending it on rent is like throwing it into a black hole. I think I’ll have to look again in a year or so, assuming my situation doesn’t change too much between now and then, to really decide how the costs of living on a boat in Singapore stack up. thanks for sharing your cost of living comparison. Thanks for sharing your experience, I have often wondered how it is like and if I can make a retirement home out of it. I would be most interested to see some pictures if any… Cheers! Glad you liked the post! I certainly think living on a boat would be an interesting retirement home. Most of the people I meet who live aboard are retired, and taking their time cruising around the region or the world. Click around in the archives of the blog, there are lots of pictures! And I’ll keep posting more, of course. i always wonder how much it would cost for living on boat. Thx for the tips! The figure seems not much different in total but it is worthy as it is the sense of lifestyle. I have a chance to move to Singapore. Could you give an update? Hi Craig, see http://oiaboat.wordpress.com/2010/11/09/living-on-a-boat-in-singapore-a-six-month-cost-comparison/ which is only a couple weeks old. Keep in mind that I haven’t lived in an apartment here for 8ish months now. If you’re looking at apartments, be aware that prices are climbing rapidly. The apartment I was renting for S$2500 is now going for around S$3300. Coupled with Singapore’s currency appreciation things are getting pretty expensive here for expats. Thanks for your post. I have a unique situation. I’m a foreigner with no work status in Singapore so I’m not allowed to rent any home in Singapore. Technically in Singapore I can only be a non-paying guest at someone’s place or rent a hotel unless I’m on some type of long-time pass which I have no need for. Today I was thinking about the possibility of renting a boat somehow and found your blog which was helpful. Would you happen to know what the possibilities there would for someone like myself to rent a boat to live on. I’m particularly interested in having easy access to the West side of Singapore such as the Bukit Timah nature reserve area and would be looking for the easiest access to that side of town if I could find a boat to rent. Would happen to have any further ideas? I think you’ll find that the boat rental market in Singapore is essentially limited to charters. I certainly don’t know of any boats suitable for living aboard that you could rent here for a reasonable rate. You may find different in nearby places like Phuket, in which case you could conceivably sail down here and berth at RSYC, Raffles Marina, Keppel Bay Marina, or even One 15. Depending on how long you’re here though, you might instead consider renting a serviced apartment, some of which I think you can probably get without a work pass. All that said, it may still be cheaper to get a hotel room if you’re not here for a long time. Of course, if money is no object, I’m sure there are boats to be rented at charter rates. Hei Wei Teck: I haven’t, simply because I haven’t been living in an HDB or condo so I have no basis for comparison. But anecdotally it seems the cost of living on land is rising fast; the cost of living aboard has been relatively stable for a couple years at least. I am also looking at long term live aboard scenario..
Hi Eff: not exactly. I do think your best bets are One 15 or RSYC (more centrally) or Raffles (in the West). You might check out Changi SAF Yacht Club in the East but it’s been a few years since I’ve been there. I believe Keppel Bay is pretty well full. Best of luck! I am also curious if the security is safe enough that you may not need to lock the door if you are sleeping on board? Since I have never live on board like you do, perhaps its good to know how is the security aspect too. Thank you in advance.. The answer to most of your questions depends on where you are. In any marina in Singapore you’ll be very safe. Plenty of places in the world are less so and you’ll want some form of security (e.g. a lockable grate on your companionway), even/especially when moored. As far as the rest, if you’re in a marina laundry’s usually pretty easy; if not you’re limited to a good old bucket. And if you get the right boat, cooking aboard is almost as easy as cooking in an apartment! hi charlene n Kris, i think what u did is adventurous, noble n looking forward to future living. i m now in central america back in singapore by mid june, july. i m also seriously thinking of living maybe on a sail boat or i will build a barge. i am keen to meet you all if its possible. i think instead of taking public transport, one can opt to cycle or a mix with public transport. please keep me updated. Thanks for sharing on your blog. I want to be your neighbour, maybe. Hi Thim Yee — best of luck in your adventures! We are done for now and are not in Singapore, so probably won’t be able to meet up there, but do get in touch if you progress with your plans, especially if you need any advice. Hey Kris, thanks for sharing. Wife and I are planning to buy a house boat in 1.15 soon and could use your help. Its a 3000sgft 5.8m wide and 19.5m leng5h boat which travels at max 7knots. We’re planning to buy and use this on long term. If possible please could you get in touch and maybe we can call you and discuss further. I’m a member of Sentosa Island (family pass). This cost me about sgd50…. I get my car and entire family onto the island free as many times I like. Parking is a cost though… Taxis will also use your Sentosa pass if you present it. Make sure they take their cash card out etc…. This would have saved you a small fortune…. The monorail is also free with the pass but it only goes to main beach car park via resort world….long walk to 1’15. From there.